Our initial concept was a goldfish swimming against the current down a sewer tunnel, with the option of whether to swim upstream or downstream. Early prototypes showed this mostly worked, but I couldn't figure out an intuitive damage system. If you're swimming upstream, colliding with something coming downstream feels dangerous, so it makes sense to take damage. But when you turn around, you have very little motion relative to objects in the flow, so it feels more like you're bumping into them than colliding, and that feels unfair to take damage for. We wanted downstream (farther into the game) to be more challenging than upstream, so this felt backward. Maybe something really dangerous to touch like acid barrels would have made sense, but they're still coming at you faster when you're swimming against the current. Anyway it was a design challenge I never worked out. This mechanic is still in the game, but obstacles only appear in stretches where you're forced to go downstream, and you're going fast enough that it feels fair to take damage from a hit. However, I was finding it to be more fun to smash into obstacles than to avoid them, and the game was long enough that I didn't want you to have to replay many sections. So I took out the health meter altogether and just hoped players would still have fun with it even if there's no threat of dying. Meanwhile, it became clear we could do more interesting layouts than just back and forth. We also wanted ways to manipulate the current rather than just riding it, to integrate with the "Flow" theme better. From there I focused a lot more on the exploration than the action, and the game came to focus more on the rooms than the tunnels connecting them. One thing I worried about was players mixing up different areas or just having trouble finding their way around. I tried to imagine how we could give different feels to different sections by changing up simple things like room size and flow rate. By Sunday night I had this sketch. 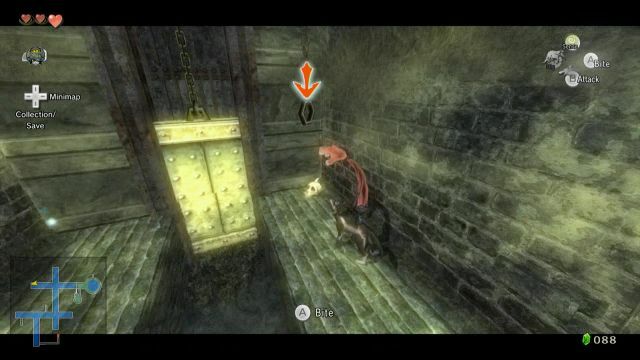 The idea was that you would unlock abilities after beating the various challenges, that would let you gain access to new areas, but it still wasn't clear how you were supposed to manipulate the flow. On Monday I decided to sketch a concept for the final boss sequence, trying to think of how you could possibly use flow rates to escape a confined area. This sketch turned out to be really useful. I was still trying to imagine what would go in the various sections of the game. One game design idea I've heard is that the final boss should be a "final exam" of everything you've learned to do over the course of the game. I took that to heart here for the first time, and worked backward from the final boss by considering what you should know before you get there. That's why there's one section with whirlpools, one section with a semi-fixed camera view, etc. I definitely plan to try this approach again. It took a while for EnigmaticArcher and me to settle on the flow mechanics we actually have. We were originally planning a couple ways of raising or lowering the water pressure in a room, switches to open pathways and close others, changing the water height, etc. But we were having trouble making any really interesting challenges out of it. Finally we got one that just involved a "fish food" powerup to let you swim up, along with the draining from the boss battle. This is way simpler than what I thinking, and I think that's mostly good. I'm a little worried players will be able to beat the challenges without really understanding the mechanics, just by taking available options and getting lucky sometimes, but that's better than being completely stuck. Anyway I was able to fill in the areas with layouts that felt different enough for my taste. One thing I like about the draining mechanic is how it naturally works to track your progress in the central room. The action of returning after a challenge is the same thing that gets you closer to opening the final boss area, and the waterfalls in the room are a handy way to know which challenges remain. And it's a lot better than keys or something, thematically speaking. I'm proud of the camera system. I wanted a good automatic camera for people who didn't want to bother with controlling it, but mit-mit wisely requested a manual camera too, because it's so easy to mess up the camera in a 3d game like this. I was able to get both in, including a few different modes for the automatic camera depending on the feel I wanted, and I think they all integrate pretty smoothly. My biggest regret is that I never figured out how to make the action sequences very fun. The one at the very end in particular was way too long and narrow, and I was running low on time so I just cranked up the speed. Now it's basically impossible and even less fun, but at least it's over quickly. It was pretty frustrating when the save/load feature stopped working on the last day (especially since the same method would allow you to reset the puzzle). For a game this long with this much in the way of graphical demands, you can count on a few players getting crashes or glitches before the end. So the cheat codes were an essential last-minute design hack. I just hope players are okay using them. There are a definitely a few rough spots I wish I'd had more time for, and it certainly could be tweaked to improve the challenge and fun level, but there's also a lot of details I really like about this game, and I don't think there are any horrible design flaws, unfair challenges, or excess filler content. Overall I'm happy with the result.